They are idols of the American West, heroes of cowboy movies and children's stories, such as "Black Beauty" and "My Friend Flicka," and a national audience will cheer their speed and power at this weekend's Kentucky Derby. Nevertheless, until recently, we slaughtered horses in this country for food -- not for domestic consumption, because few Americans eat horsemeat, but for export to Europe and Asia where their meat is considered a delicacy. The practice ceased to exist here in 2007 and -- despite an effort to revive it in the past year -- remains illegal because Congress has withheld funds from the U.S. Department of Agriculture to inspect horse slaughterhouses. The prohibition is tenuous, and depends on Congress holding back resources from the USDA each year. Still, the tide of public opinion in the U.S. has turned against horse slaughter. But American horses are still slaughtered -- 152,814 of them in 2013, according to the Equine Welfare Alliance -- across our borders in Canada and Mexico (and a small number in Japan). That's because it is still legal to take horses to slaughterhouses outside the country, and a cottage industry has emerged to buy and transport American horses to their deaths. 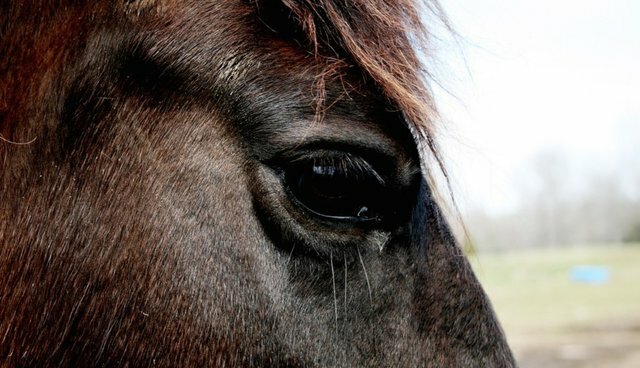 There is a bill in Congress to stop horse export for slaughter, known as the SAFE Act, but it remains stalled in committee in the House and Senate. We visited two of the estimated 100 similar weekly horse auctions in this country, in Sugarcreek, Ohio, and Shipshewana, Indiana, to see the beginning of this slaughterhouse pipeline up close, with Sonja Meadows, President of Animals' Angels, a nonprofit organization focused on improving conditions for farm animals, serving as our guide. Sugarcreek, deep in Central Ohio's Amish Country, calls itself "the Little Switzerland of Ohio." The town's official website boasts of quaint antique stores, artisanal cheese shops, and the chance to "turn the clock back to a time when life was a little more simple," but leaves out one major weekly event: the horse auction. On the bitterly cold day in late January, when we visited it, the parking lot was already filling up by mid-morning with horse-drawn Amish buggies, cars, pickup trucks and a few small horse trailers. The start of the auction was still hours away, but the horses had arrived in the dank, cavernous barn attached to the back of the auction hall. It was divided into two dozen or so pens: some were empty, some held a single horse and some were crowded with 15. The water troughs were grimy and cluttered with debris. Visitors strode a catwalk, observing the horses from above. In the alleys between the pens, potential buyers pulled out individual horses and chased them to see if their legs were sound. Walking through the alleys, we got close to the animals. Some were clearly used to contact with humans, rubbing their faces against our hands. The so-called "loose horses," who hadn't been ridden or otherwise tamed, were fearful of humans and huddled at the back of their pens. The wooden slats on the doors were rough and worn down. According to Sonja, the horses gnaw on them out of frustration and to calm themselves in the stressful environment. Some horses looked fit and proud. Others were thin, with protruding bones and bulging eyes. Several tall horses looked like the ones used in the area by the Amish to plow their fields. One of these draft horses had a terribly swollen back leg. We saw a quarter horse and even a Thoroughbred. The auction was about to start, and spectators gathered in a rough, wooden 10-row amphitheater that was attached to the barn so the horses could be shoved into the tiny auction ring through one door and prodded back into the barn through another. During their few seconds in the ring, the frightened horses were pushed around so buyers could see them from all angles. 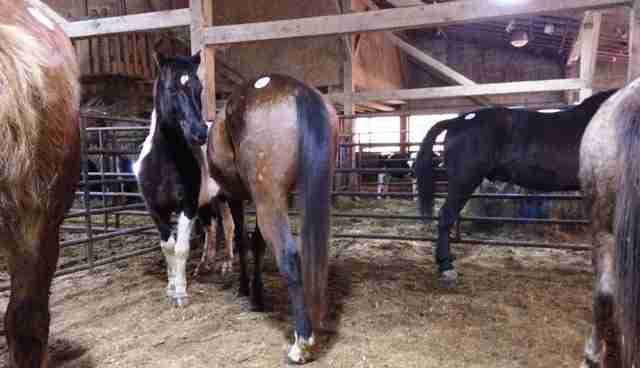 Two buyers-who regularly supply Canadian slaughterhouses, according to investigations by Animals' Angels- were purchasing most of the horses, at prices ranging from $35 to as high as about $300. The auctioneer repeated "sold to Baker" and "sold to Double Ought," but where were these buyers? It took some time before we detected their minute hand signals, and they seemed to have a tacit understanding to not bid against one another. If one of them wanted a horse, no novice could compete. The buyers for the slaughterhouses did most of the buying, but not all. A miniature pony was bought for a child, and the Thoroughbred was apparently too expensive for them, although Thoroughbreds have been caught in the slaughter pipeline. And even though everyone surely knew that most of the horses sold were going to slaughter, the auction had a festive, carnival atmosphere. A small cafeteria sold the kind of food you would expect at a high school basketball game -- colorless hotdogs, popcorn and candy. A row of buggies out front corresponded with Amish families inside; apparently, this was the week's entertainment. A man sold puppies out of a crate, and a group of women hung around for the main event after buying the saddles, blankets and harnesses sold in a pre-auction. The owner of the hall offered children candy from a plastic bucket as they headed out the door. After the auction ended, a kill buyer loaded the waiting cattle trailer. We couldn't get close enough to see the loading, but from across the parking lot, we heard men shouting and slapping; dozens of horses whinnying as they were forced up the loading ramp; horses' hooves clanking on the truck's metal floor. We attended the Shipshewana, Indiana, horse auction on Good Friday, one of the two largest auction days of the year there, and experienced a day-long production in which hundreds of horses were sold. The vast Shipshewana Auction and Flea Market is in the village's core business district, next to the Auction Restaurant and across the street from the Farmstead Inn. The parking lot between the Market and the Restaurant was far more festive than Sugarcreek, becoming an impromptu fairground, where visitors purchased Auntie Anne's pretzels, kettle corn made on the spot, puppies and kittens, saddles and other riding accoutrements, and Shipshewana mugs and T-shirts. Suddenly, we heard the whinnying of horses and the gabble of an auctioneer at the back of an enormous barn attached to the auction hall, and realized that an auction was beginning. This was the "loose horse" auction, also known as the "kill" auction, a pre-event: held quickly, outside the auction hall, and before the main event's starting time. As bidders crowded around the auctioneer, wranglers prodded the horses from the holding pen one by one, slamming the gate in the face of any horse who tried to follow. Once sold-for as little as $10 -- they were pushed into pens behind the barn. 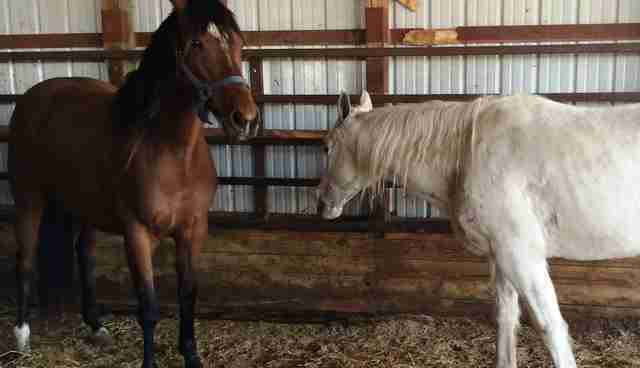 Two frightened horses darted out of the holding pen together, causing bidders to start to scatter and climb the wooden fences to get above the potential fray. "No cameras!" the auctioneer shouted, repeating a message posted on signs throughout the barn: "NO CAMERAS!" When this auction was over, we went into the pens where the sold horses awaited transport. One badly injured horse's leg bone protruded through a swollen wound. Some looked malnourished. 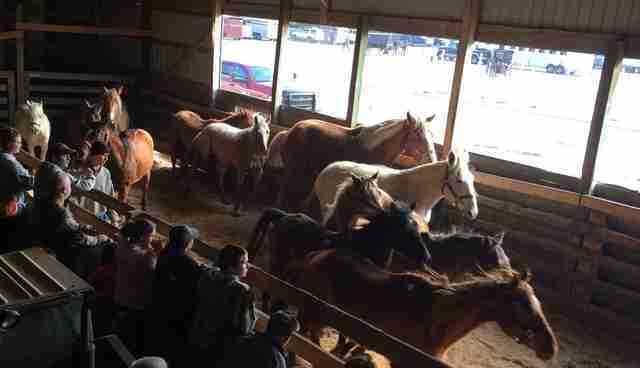 A group of teenagers from True Vine Equestrian Center, from Lawton, Michigan, huddled in prayer; they attend the Shipshewana auction every Good Friday to rescue a horse or two from slaughter. "We're saving God's creatures," one said. Inside the hall, the main auction was about to begin in front of a packed audience. As horses were led into the ring, the auctioneer read a list of their attributes. These were racing, riding, and show horses, and some of the prices topped $3,000. But the slaughterhouse buyers were there, too, to bid on the least expensive horses. Toward the end of the auction, around 4 p.m., the cheapest horses were brought in, and the amphitheater started to clear out. The kill buyers became the main bidders. One actually sat at the auctioneer's desk, bidding by leaning forward and waving his hand. Then the buyers loaded up their horses. The semi-trailers backed up to the barn were obviously those of the purchasers for slaughterhouses--they had come to buy in bulk. A young couple took a look at these horses waiting to be loaded. "I have come here every year since I was a kid," the woman said. "I love the horses, but not horse slaughter. I can't say that too loud around here, because my view isn't popular." She and her husband wanted to rescue one of them. She negotiated with the buyer, but couldn't afford his $700 price. Her eyes filled with tears and her husband walked away. "He can't stand to see this," she said. Out in the grass behind the Auction Restaurant, a young woman sat beside an emaciated mare she had saved from transport to a slaughterhouse. "I waited all day to see who was going to load her in the end," she said. "The kill buyer paid $35 but wouldn't sell her to me for less than $150." The mare was ravenously eating grass. "Look at her! She needs someone to take care of her, to feed her. I am going to do that." To support the SAFE Act, which would ban the transport of American horses to foreign slaughterhouses, contact your Representative or Senator. Animals' Angels, The Animal Welfare Institute, Peta and HSUS all support the SAFE Act.